One of the things that makes protein unique when compared to the other macronutrients is that the body can’t store proteins the same way that it can store fat and carbohydrates. This means that it is essential to have adequate protein intake every day (U.S. National Library of Medicine, 2015). But how much protein is "adequate" for the average person? Well, the Recommended Dietary Allowance (RDA) for protein is 0.8 grams of protein per kilogram of body weight (Pendick, 2015). So, a person weighing 160 pounds, for example, would need 58 grams of protein each day. While getting enough protein is essential to your bodily functioning, adding more protein to an already balanced diet has its advantages. For example, protein can contribute to your efforts to build muscle. During an intense workout, muscles undergo microscopic damage. Proteins provide the raw material necessary for constructing additional muscle fibers and rebuilding broken fibers with a thicker constitution- amounting to greater muscular strength and endurance (Schoenfeld, 2010). Those seeking to build muscles need to consume more protein than the standard RDA for their weight in order to facilitate the construction of these new and improved muscle fibers. This being said, we've all found ourselves gorging on high-protein foods like steak or meatloaf to "bulk" only to find ourselves weighed down and unable to keep up with our regular exercise routine. So, then, how can we add protein to our diet without having to worry about its preceived ill effects? Getting protein from lean, non-animal sources can preserve muscle tissue and help you maintain a healthy weight (Pendick, 2015). When choosing proteins to add to your diet, the type of protein matters. Animal products are high in protein, but they can also have high amounts of saturated or trans fats. The following list includes only foods that offer protein amidst an overall healthy nutrient profile. Pairing these protein sources with fiber-filled foods, like fruits and vegetables, and healthy starches, such as quinoa or oats, can keep your diet balanced and healthy. Eggs are complete proteins, giving you all 9 essential amino acids. They're also a source of selenium, vitamin D, B-vitamins, zinc, iron, and choline. One large grade A egg (53 g) contains 6 grams of protein and 70 calories. (Egg Farmers of Canada, n.d.; United States Department of Agriculture, 2016; National Institutes of Health, 2016). Tofu and tempeh are great non-animal protein sources. They can be added to nearly any meal for a healthy protein boost without the saturated fat found in animal proteins. We also carry soy protein powder to add to your smoothies and shakes. Dairy products make great snacks, ingredients or side dishes and are rich in a variety of amino acids. Opt for lowfat or nonfat versions of these dairy products to limit your saturated fat consumption. Protein deficiency can particularly pose a problem for strict vegetarians, people with eating disorders such as anorexia nervosa, and those with gastrointestinal problems such as Crohn’s disease or ulcerative colitis. These groups of people must be particularly vigilant that they get enough protein in their diets and protein from a variety of sources. It is important to get protein from different sources, particularly for vegetarians and vegans, because of the composition of different proteins and their contributions to the body. Proteins are composed of building blocks known as amino acids. The body breaks down dietary proteins into these building blocks before rearranging them to create structures needed for a wide variety of essential functions throughout the body. Dietary proteins are placed into two categories: complete and incomplete proteins. Of the twenty amino acids that our bodies need, only nine cannot be synthesized by the body and must be obtained via the diet; these amino acids are considered essential. 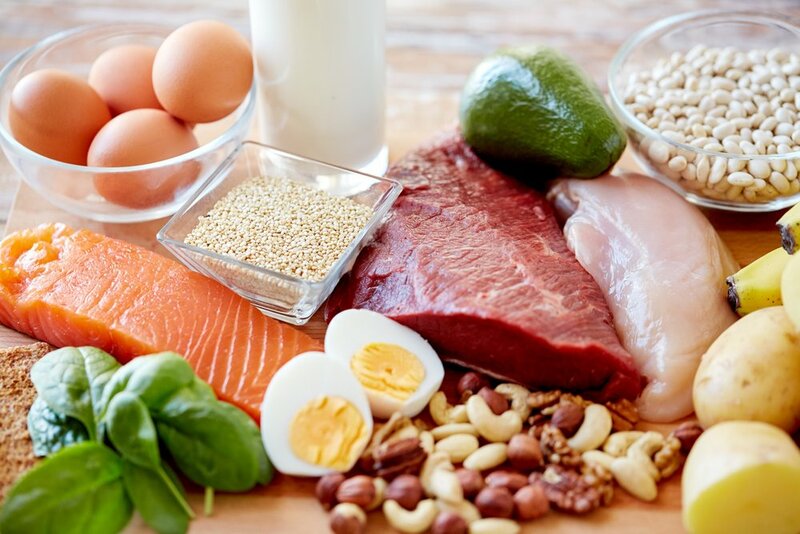 A complete protein is one that contains all nine essential amino acids (National Research Council US Subcommittee on the Tenth Edition of the Recommended Dietary Allowances, 1989). Many animal proteins, such as red meat, poultry, fish, eggs, and dairy products, are complete proteins, though there are also non-animal complete proteins, including quinoa, soy, sprouted grain bread, and buckwheat. Fortunately for vegetarians, it is also possible to eat complementary incomplete proteins that provide the full nine amino acids your body needs. For example, eating legumes with nuts and seeds provides all of the essential amino acids. Similarly, legumes and grains (e.g. brown rice) are considered complementary proteins. It is not essential to eat these foods together at the same meal; as long as you get several complementary forms of incomplete protein throughout the day, you will get the amino acids you need. When your body does not get enough protein, things begin to go awry. Muscle fatigue or a drop in muscle strength may be signs you’re not eating enough protein (National Institutes of Health, 2008). Additionally, be watchful for symptoms such as brain fogginess, confusion, weakness, poor immune system functioning, and hair falling out (Tedesco, 2014). These are all possible signs of protein deficiency that should go away once you begin getting enough protein again. Build muscle and support your cellular health with the delicious dishes below. For more recipes and snacks that are packed with protein, check out our article on high-protein snacks! Start your day with a filling plate that’s packed with protein. Each bowl of this classic breakfast dish offers 13.5 grams of protein and a pleasant palate of pistachio. If you’re hoping for a post-workout shake to replenish your reserves, the 19 grams of protein in this blended beverage are sure to help! For vegetarians, this vegan recipe also offers an abundance of essential minerals your diet may be missing! A perfect snack for anytime, these scrumptious bars offer nearly 14 grams of protein per serving and are also a rich source of fiber. With a blend of complex carbohydrates and protein, these bars serve as another idyllic snack to enjoy after your workout! A simple dinner recipes that is ideal for parties, these stuffed peppers are packed with protein without the use of meat, offering an impressive 30 grams with each delectable serving. This scrumptious dish delivers nigh 18 grams of protein in a vegan dinner that is nutritionally balanced with essential vitamins and minerals. 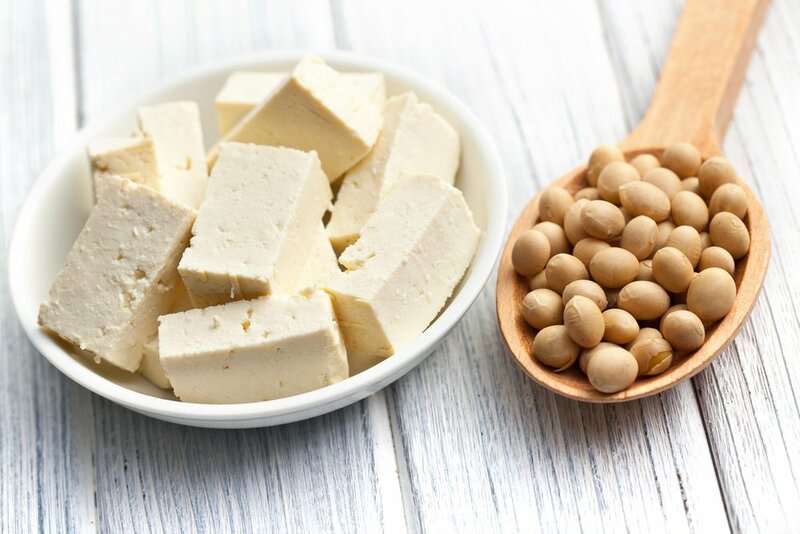 For additional protein, meat-eaters can also substitute a lean protein like chicken breast for tofu. Another dinner plate, this risotto provides 19 grams of protein and an abundance of fiber, iron, and complex carbohydrates. For another delicious vegetarian dish, try this recipe today! Eating enough protein during the day can happen with ease. One great way to ensure your snacks also supply a portion of protein that can help make the difference in your diet. With 7 grams of protein in each ounce of these piquant peanuts, these treats serve as more than just a palatable snack. In addition to their provision of protein, each ounce also contains 3 grams of fiber! Pepitas are a beloved treat that are often enjoyed as snacks or salad toppings. But these scrumptious seeds offer more than just a satisfying crunch and a savory taste, as each ounce contains a whopping 9 grams of protein, 3 grams of fiber and 15% of the Daily Value (DV) for iron! Our black pepper beef jerky is a stellar source of protein with 12 grams in each ounce. This jerky contains only 1 gram of fat per serving and a meager 80 calories. We also contain a wide variety of spicy and sweet flavors of the jerky to accommodate any preference. These crunchy nuggets are perfect for a snack or salad topper. Plus, each serving has 18 grams of plant-based protein and 4.5 grams of dietary fiber. A great snack for anytime, particularly at the ballpark, these sunflower seeds include 6 grams of protein in each 1 ounce serving. The seeds also offer 3 grams of fiber which can help to fill you up while you snack! A decadent dessert with healthful twist, these pieces combine the nutrient-packed crunch of almonds with the luscious sensation of dark chocolate. The result is a delicious indulgence that adds 3 grams of protein to your plate along with 3 grams of fiber! For those that love the creamy texture and rich flavor of peanut butter and the savory sensation and soft crunch of a salted pretzel, it doesn’t get much better than our delectable peanut butter filled pretzels. A little more than an ounce of these pieces packs 5 grams of protein. A hearty trail mix that blends a broad plethora of tastes and treats, this combination takes the sweet and savory and adds a potent punch of piquant spices! Ideal for those that often battle bouts of cravings for spicy snacks, this portable portion packs 5 grams of protein and 3 grams of fiber in each 1.1 ounce serving. No matter what snack you’re enjoying, a scoop of almond butter provides the perfect path to a healthy helping of protein. Each ounce of the spread serves up nearly 6 grams of protein and 3 grams of fiber. The spread is so delicious, you can even enjoy a spoonful or two right out of the jar! A brilliant way to start the day, this superfood cereal serves up more than just 3.5 grams of protein in each 1 ounce serving; the crunchy treat also touts 2.5 grams of fiber per ounce. The blend also packs a healthful blend of essential vitamins and minerals. This scrumptious smoothie packs protein into a sweet drink that you're sure to love. What Makes a Good Post Workout Meal?